Have you ever accidently deleted a file, or removed a crucial part of a document only to realize it no longer makes sense? 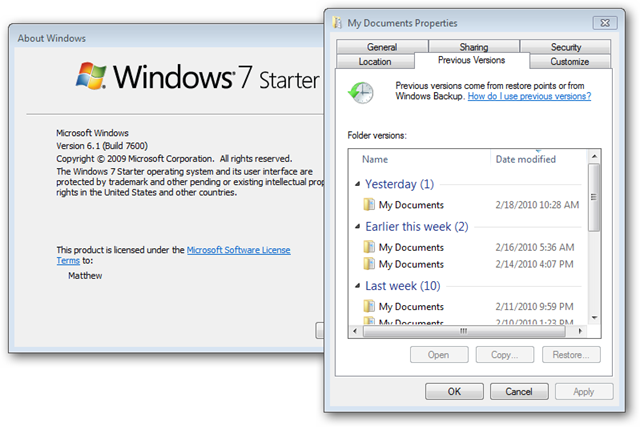 Windows 7 is smart enough to protect you from yourself, and here we’ll see how you can restore files in any edition of Windows 7. The Previous Versions features is a part of the volume shadow copy service, which creates restore points to help roll back changes to your computer in the event of a problem. 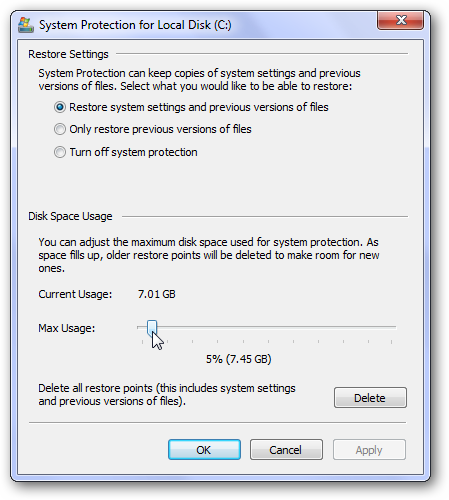 It is also the backend for the surprisingly good image based backup in Windows 7. By default, shadow copy will save a copy of your files once a day, or when activated explicitly such as when installing an update or new program. 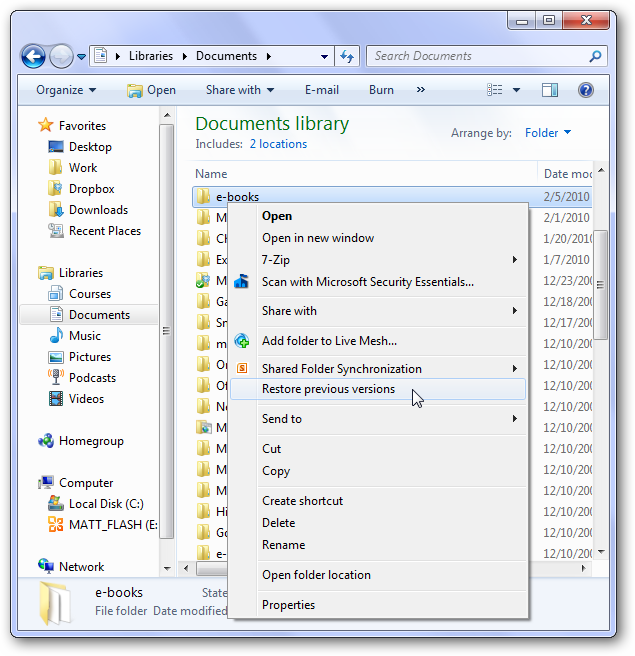 The Previous Versions feature was actually a new feature in Windows Vista, but was not directly available in the Home editions of Vista. 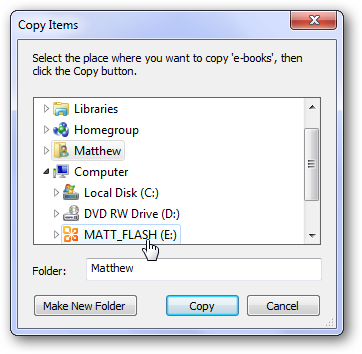 However, the volume shadow copy service was still present, allowing even users of Home editions of Vista to access previous versions of their files. The default method is much simpler, so thankfully it is now included in every edition of Windows 7. 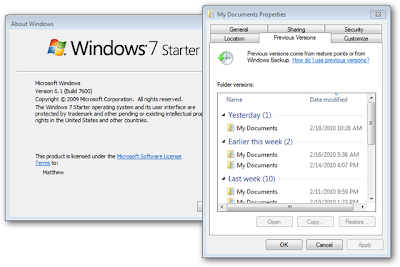 It is simple to access previous versions of any file or folder on your Windows 7 computer. 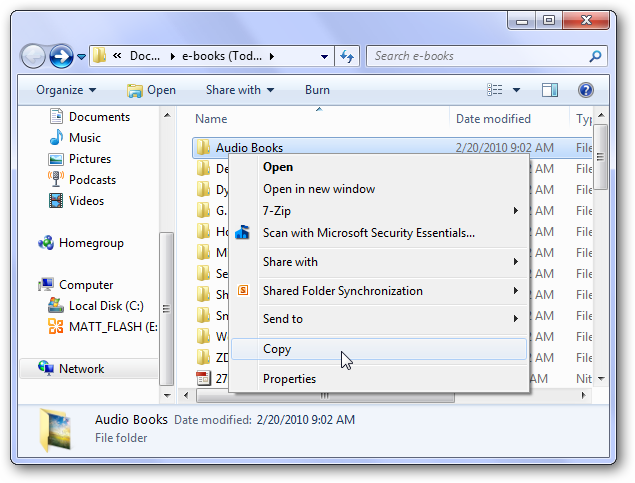 Simply open any Explorer window, right-click on a file or folder you wish to restore, and select “Restore Previous Versions.” For instance, if you accidently deleted a file from a folder in My Documents, browse to that folder and open previous versions from it. Please note that this will only appear on files and folders, not drives or Libraries. When in this mode, you are directly browsing the shadow copy of your hard drive. 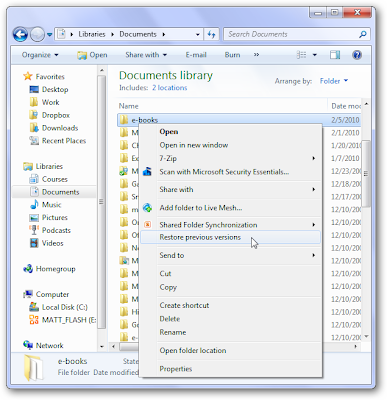 The path to the folder shows the date and time of the copy. And, the great thing is, this feature is available in all editions of Windows 7, including the low-cost Starter edition often preinstalled in netbooks. 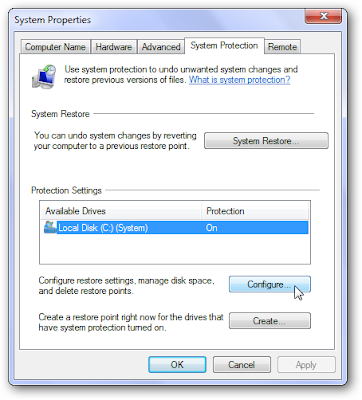 By default, the shadow copies of your files will use up to 5% of your hard drive space. 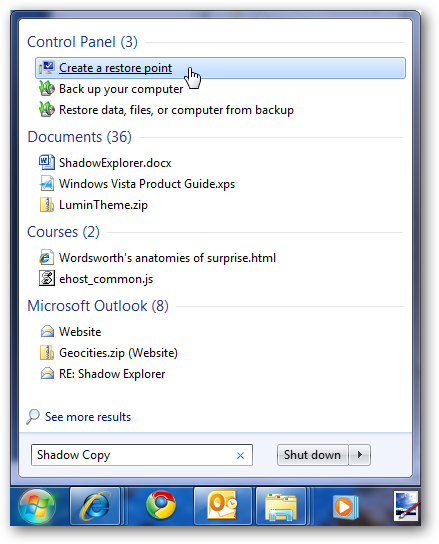 You can change this by typing “Shadow Copy” into your Start Menu search. 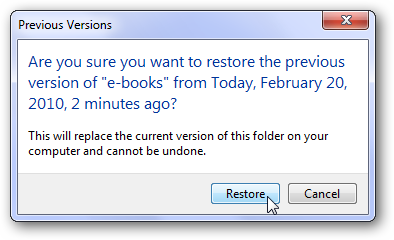 Click the “Create a restore point” link. Here you can restore your system with a restore point, create a new restore point, or configure the settings. Click Configure to manage Shadow Copy. 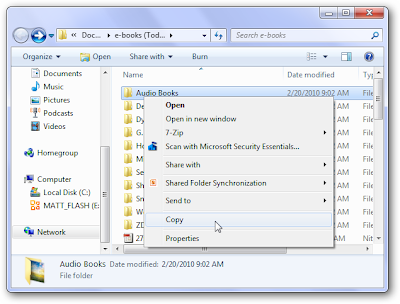 You can choose to save both system settings and previous versions of files, only previous versions of files, or to turn this feature off entirely (which we do not recommend at all). You can also choose how much space will be dedicated to these files. The default is 5% of your hard drive, but you can choose more or less if you wish. 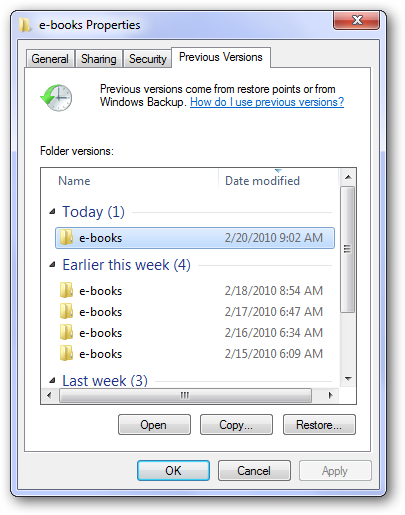 Finally, you can also remove all previous restore points, including the previous versions of all your files. The Previous Versions feature is definitely a lifesaver. You can actually retrieve deleted files using Shadow Copy in Server 2003. It has saved us many times when we accidently deleted a file or removed important information from a document only to realize what we had done minutes later. For these and many other reasons, don’t panic and just check Previous Versions if you ever lose a file.